Near preston Idaho 8/7/18 836pm We were headed back from maple groves hotsprings when I was falling asleep and my long term partner got extremely excited about the sky. It was us two adults and 4 children. We saw this object in the clouds so we pulled over. 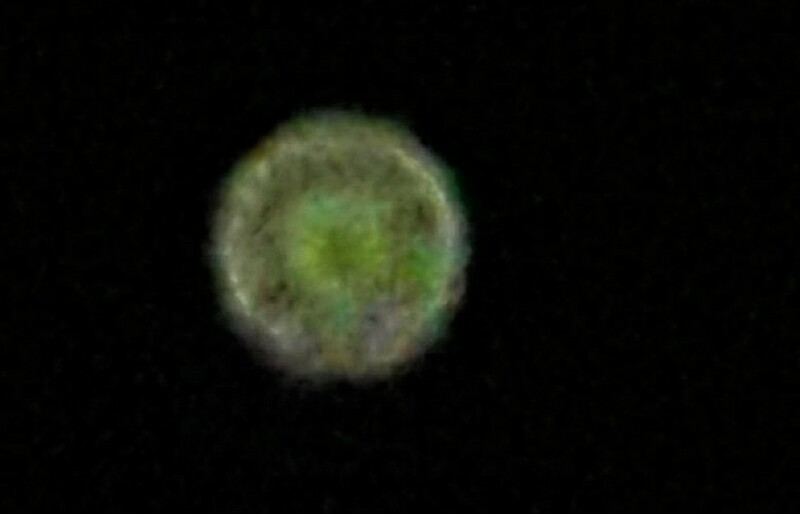 It was around (moon was more south) it was round with lights downwards off of it.it wasn’t moving. It looked white but in photo it looked green Nothing would show up and video and I only got one picture that actually showed. I felt calm during watching it but got the hyper energy after. We all seemed to have a hyper energy after. The object was still in same spot when we left.we had to leave due to having kids with wet hair and it getting late.